A common apprehension among women is not knowing what to wear on the golf course. 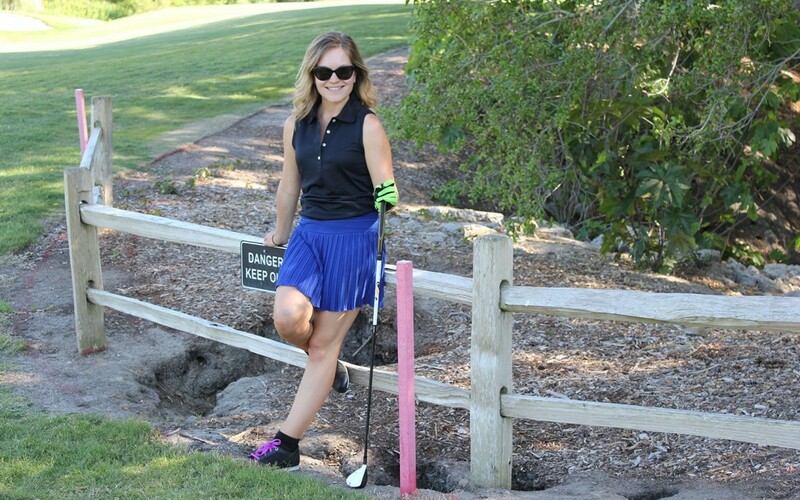 Unlike their male counterparts, women’s golf clothes do not mirror business casual attire. Therefore, a woman must know what golfing attire consists of and where to find it before heading onto the course. On the golf course, women have to dress more conservatively than they might dress in the office. Even then, some of the golf fashion available isn’t appropriate for the golf course (especially depending on the exclusivity of the club)! As an avid golfer, I have found golf brands and styles that work for me. I particularly like the golf lines from Lizzy Driver, Schriffen, Jofit, and GGblue, to name a few. But, golf clothes are expensive. Nearly twice as expensive as tennis clothes and casual wear, which often precludes women from taking up golfing. Ladies, have no fear! It is possible to find clothes that are appropriate and comfortable for the golf course without looking further than your own closet. Below you will find 7 secrets for dressing appropriately on the golf course! Pants: Colored khakis or capris are the best choice for pants, but black exercise pants are an acceptable substitution if the only other option is jeans. FYI – BLUE JEANS ARE NEVER ALLOWED ON A GOLF COURSE – No Exceptions! Tops: Collared shirts are the safest bet. This could be a long sleeve exercise shirt or a more formal button down that you might wear out on the town. Shoes: If you aren’t ready to buy golf shoes, just wear your running shoes. They won’t offer the same stability, but if you are just starting out, you might not notice the difference. Skirts: If you wear a short tennis skirt, wear tights or spandex underneath. If it is too warm for tights, wear a longer skirt. The acceptable skirt length for most golf courses is that it passes your fingertips when standing up straight. Clubs like Cypress Point, Augusta, and San Francisco will want your skirt below the knees (no exceptions). One last thing: If you go to a more exclusive course, wear pants or purchase a golf outfit. While it isn’t ideal to purchase a new outfit, the golf club has the authority to send you home for inappropriate dress. You could potentially embarrass the member of the club who invited you to play and risk not being invited back. If you are looking for an inexpensive starter outfit, check out stores like Marshalls or TJ Maxx. They always have golf clothes at a great price. When in doubt, wear what you wore to the office out to the course and just change your shoes. If it is business appropriate, it should be golf appropriate!